1ENT Division, Department of Surgery, P.O. Box 35, Al Khod 123, Muscat, Sultanate of Oman. 2Department of Radiology, College of Medicine and Health Sciences, Sultan Qaboos University, Sultanate of Oman. *Address correspondence and reprints request to: Rashid Al-Abri, ENT Division, Department of Surgery, P.O. Box 35, Al Khod 123, Muscat, Sultanate of Oman. Al-Abri R, Bhargava D, Al-Bassam W, Al-Badaai Y, Sawhney S. Clinically Significant Anatomical Variants of the Paranasal Sinuses. Oman Med J 2014 Mar; 29(2):110-113. Objective: Anatomic structural variations of the paranasal sinuses have a practical significance during surgical procedures conducted on the sinuses by otolaryngologists. This study aims to evaluate the prevalence of clinically significant anatomical variations of the paranasal sinuses. Methods: A prospective analysis of 435 computed tomography (CT) examinations of adult Omani patients was conducted to determine the prevalence of clinically significant anatomical variations of the paranasal sinuses. A total of 360 CT scans were included from January 2009 to January 2010. Results: The findings showed abnormal Agger nasi cells in 49% of cases (95% CI: 44-54%), concha bullosa in 49% (95% CI: 44-54%), Haller cells in 24% (95% CI: 18-31%), asymmetry in anterior ethmoidal roof 32% (CI: 29-37%), Onodi cells in 8% (CI: 5%-10%). The type of skull base were as follows; Type 1 was 30% (n=107; 95% CI: 25-35%), Type 2 was 34% (n=123; 95% CI: 29-39), and Type 3 was 36% (n=130; 95% CI: 31-41%). Many other surgically significant anatomical variations in small numbers (1-3) were incidentally identified. Conclusion: Knowledge of the presence of anatomical variations of the sinuses has a clinical significance as it minimizes the potential for surgical complications. There is an ethnical difference in the prevalence of anatomical variations. Further studies of anatomical variations with clinical disease correlations are needed. Keywords: Anatomical Variations Paranasal sinuses; Haller cell; Onodi cell. Understanding the complex anatomy of the skull base is crucial for the safe endoscopic sinus surgery; inadvertent violation of the cribriform plate may cause CSF leak, direct penetration trauma to the dura, serious intracranial and intracerebral complications.5,6 Preoperative CT scan evaluation of patients undergoing ESS is mandatory. The radiologists normally focus more on pathological abnormalities than the anatomical variations and abnormalities. This study aims to identify the anatomical variations of the paranasal sinuses in the Omani population, this knowledge will be useful for future endoscopic surgeons in order to understand the pathogenesis of sinusitis and therefore avoid iatrogenic injury due to these anatomical variations. Researching these abnormalities can provide information on the pathogenesis of Sinusitis and improve the safety of the procedure in Oman. There are many racial and genetic factors responsible for these anatomical variations, and there is a variation of these in different populations and races.7 This is the first study of this nature in Oman; moreover there are no published studies focusing on this issue from the Arab world. Hence, this study aims to identify the anatomical variations of the paranasal sinuses in the Omani population and their clinical significance. In this prospective analysis, 435 CT Scans were evaluated; 360 CT scans of adult (aged 18 years and above) Omani patients who attended the ENT clinic with chronic sinonasal symptoms from January 2009 to January 2010 were included. The findings were reported by a single radiologist and were analyzed prospectively. Seventy five post operative CT scans malignancies, invasive fungal disease, diseases invading or eroding the bones of the sinuses were excluded. The investigators recorded and reported the findings in Excel. In this scheme, the sinuses were examined for drainage pathways, patency and structural abnormalities in the lateral nasal wall. 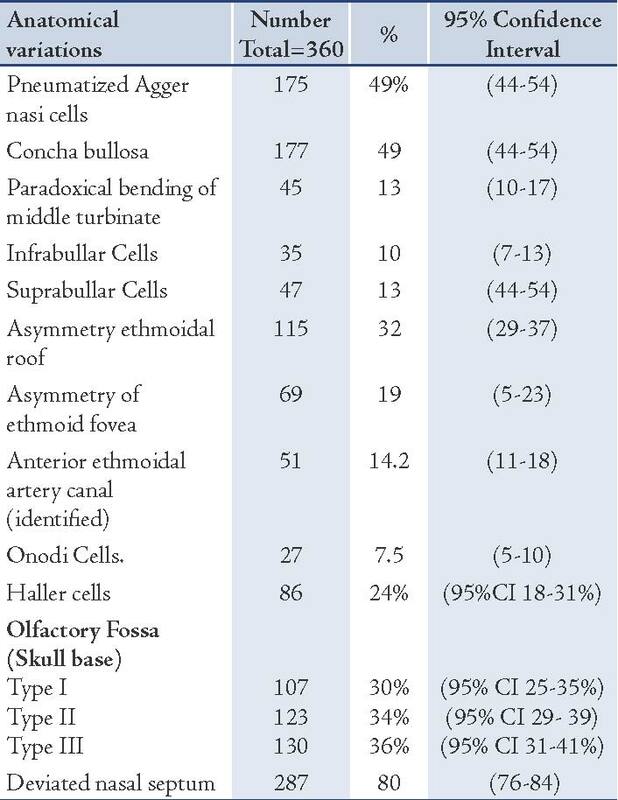 Twelve areas were specifically looked at for anatomical variations (Table 1) including; Type of skull base, Anterior ethmoid artery, Agger nasi cells, Haller cells, asymmetry in anterior ethmoidal and onodi cells. Statistical analysis was performed using SPSS version 16. The Confidence Interval (CI) was calculated using a confidence Interval calculator to calculate proportions. In this study, the common anatomical variations found among the 360 CT scans evaluated were Pneumatized Agger nasi cells, Concha bullosa, Asymmetry ethmoidal roof, Haller cells, Asymmetry of ethmoid fovea, Anterior ethmoidal artery canal, Paradoxical bending of middle turbinate, Suprabullar Cells, Infrabullar Cells, and Onodi cells. Table 1 shows the prevalence with CI of anatomical variations for the CT scans studied. Other unlisted and unexpected incidental anatomical variations included; pneumatized uncinate process in three films, pnuematized superior turbinate in CT (n=5), the presence of septations adjoining the carotid in the lateral wall of the sphenoid or posterior ethmoids and exposure of the optic nerve within the posterior ethmoid and sphenoid (n=3). In addition, there were one each of the following; pneumatized supreme turbinate, pneumatized crystagalli, dehiscent roof of frontal sinus, rudimentary right maxillary sinus, absent inter sphenoid septum, pneumatized septum and rudimentary frontal sinus. Table 1: Prevalence of various anatomical variations with 95% Confidence Interval. Figure 1: Demonstrates the close relation of posterior ethmoidal air cell adjacent to skull base. Figure 2: Demonstrates the intimate relation of the abnormal laterally placed ethmoid air cell complex with optic nerve (Onodi cell). The mainstay of surgical management of chronic sinusitis is endoscopic sinus surgery (ESS). The goal of ESS is to restore physiological sinus ventilation and drainage. Minor complications of this procedure include bleeding, infection and adhesions. Major complications include orbital injury, intracranial injury and CSF leak.1 In some patients as demonstrated in Fig. 2, which shows the close relation of a posterior ethmoidal air cell is adjacent to the skull base, if the surgeon is unaware of this cell, he is likely to injure the skull base leading to intracerebral complications. Some patients demonstrate the intimate relation of the abnormal laterally placed ethmoid air cell complex with optic nerves shown in Fig. 3. This being an Onodi cell, while operating on this patient the surgeon should be aware of this variation as there is an increased risk of injuring the optic nerve. 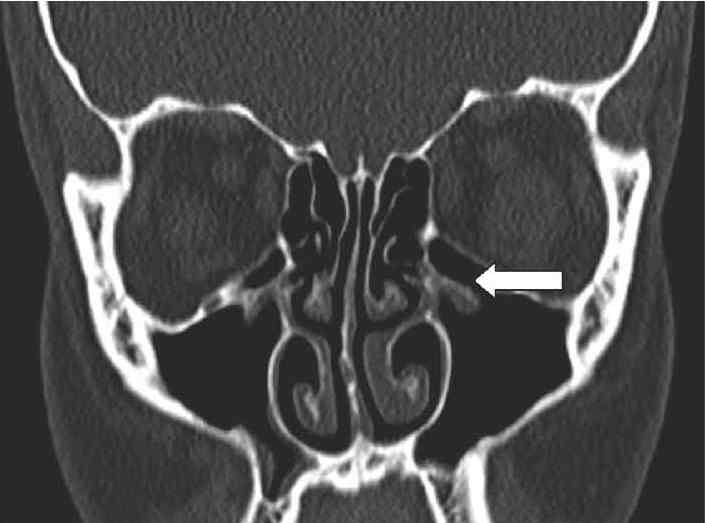 Some patients demonstrate abnormal Haller cell communicating with maxillary sinus as shown in Fig. 3, which can compromise the osteomeatal complex drainage pathway and increase the risk of orbital complications during ESS. Figure 3: Abnormal Haller cell communicating with maxillary sinus. Badia et al.7 in their study of two cohorts of 100 Caucasian and 100 Chinese patients undergoing ESS for ethnic variation in sinonasal anatomy on CT scan revealed a statistically significant difference in anatomical variations like choncha bullosa, paradoxical bending of middle turbinate, infrabullar and suprabullar cells, asymmetry in the anterior ethmoidal roof indicating racial factors influencing anatomical variations, Pneumatization of the agger nasi, i.e., anterior to the anterior attachment of the middle turbinate was the most common variant in both groups, (44-57%), which was comparable to our study of 49%. Pneumatization of the middle turbinate (concha bullosa) and paradoxical bending of the middle turbinate, were the second and third most common variants in the Caucasian population and their incidence was significantly higher than in the Chinese population. Concha bullosa occurred in 12-31% and paradoxical bending of the middle turbinate in 10-22% of the Caucasian group and in 4-13% and 5-8%, respectively in the Chinese group.7 In our study, concha bullosa was present in 45% which is higher than both groups; the incidence of paradoxical middle turbinate being comparable with Caucasian population (13%). Nouraei et al.8 in their study of 278 CT scans shown concha bullosa in 35% patients. Incidence of spheno-ethmoidal cells (Onodi cell), i.e., pneumatization of the posterior ethmoid lateral or superior to the sphenoid was 8% in our study, which is less than the Chinese population (20-30%) and Caucasian population (5-17%). The incidence of Infra-orbital cells (Haller cell), i.e., pneumatization of the orbital floor inferior to the infundibulum, was more frequent in our study group (24%) than in the Caucasian (10-15%) and Chinese group (1-9%) as reported in the study by Badia et al.7 The presence of septations adjoining the carotid in the lateral wall of the sphenoid or posterior ethmoids and exposure of the optic nerve within the posterior ethmoid and sphenoid can lead to potential complications like fatal hemorrhage and blindness.7 These were demonstrated in three CT. Figure 4: Low lying olfactory fossa (type 3) with a symmetry of skull base. Some anatomical variations can invite the endoscopic surgeon to disasters; like a low skull base, if not noticed pre-operatively it can lead to entrance in the brain causing major injury.9 In 1962, Keros studied 450 skulls and described 3 types of olfactory fossas which are formed by cribriform plate and the fovea ethmoidalis. He distinguished three types; Type 1: the cribriform plate 1-3 mm more caudal than ethmoid roof least common (11% of 450 skulls), Type 2: the cribriform plate is 4-7 mm lower, was the most common and occurred in 70% of cases, and Type 3 cribriform plate being 8-16 mm (18%); this being the most dangerous for the surgeon because of a perforation through the lateral lamella of the cribriform plate,8 leading to CSF rhinorrhea and intracranial injury. In their study from UK Nouraei et al.9 reported that 92% of patients had Keros type 1 and Ali et al.10 from India showed that 79% had Keros II olfactory fossa. In our study, 36% had type 3 fossa (Fig. 4) with an equal proportion of the other two types of skull bases. Ethnical and racial factors could explain the difference. The clinical significance of this finding is that in Oman, the endoscopic sinus surgeon should be extra cautious as a low lying cribriform plate can be expected at a higher frequency. Topographic relationships of the anterior ethmoidal artery are of particular significance in its course from the orbit to the olfactory fossa as it traverses three cavities: orbit, ethmoidal labyrinth and the anterior cranial fossa. 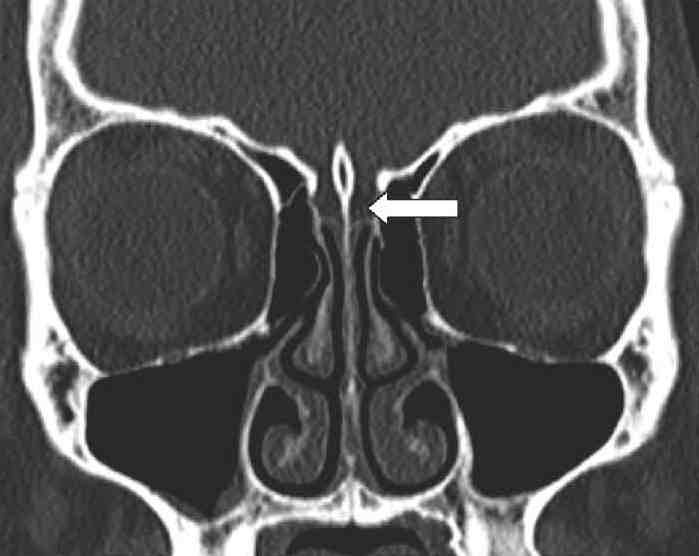 The course through the lateral lamella of the lamina cribrosa is the most critical site as it is the area of least resistance.4 Souza et al.11 in their retrospective review of 198 direct coronal paranasal sinuses reported that anterior ethmoidal artery canal was seen in 41% (81 scans). In our study, it was observed in 14%. Arif ali et al.10 showed ethmoidal asymmetry in 85%, which is much higher than in the current study (32%). The literature describes the prevalence of asymmetrical ethmoid fovea and its importance for avoiding surgical complications. Different studies have used different radiological parameters.5,12,13 As there are no published reports on the prevalence of sinusitis from Oman further studies are required to correlate anatomical variations and the occurrence of sinusitis in Oman. This is the first published study on anatomical variations of sinuses from Oman or the Arab world. The present study revealed that type 3 olfactory fossa (low lying cribriform plate) is present in over a third of the Omani population. This is in contrast to the Caucasian and Indian populations where type 1 and type 2 are more common, respectively. The Endoscopic sinus surgeon operating in this population has to expect this variation to avoid skull base injury and its complications. 1. Metson R, Sindwani R. Chronic Sinusitis. Up-To-Date 2006;1-14. 2. Bhargava D. Health related quality of life in patients with rhino sinusitis. In A guide to endoscopic sinus surgery. (2002); pp 47-48. 3. Bhargava D, Bhargava K, Al-Abri A, Al-Bassam W, Al-Abri R. Non allergic rhinitis: prevalence, clinical profile and knowledge gaps in literature. Oman Med J 2011 Nov;26(6):416-420. 4. Stammberger H. Functional Endoscopic Sinus Surgery. The Messerklinger Technique. Mosby- Year Book Inc. Philadelphia: BC Decker 1991. p. 27-57. 5. Lebowitz RA, Terk A, Jacobs JB, Holliday RA. 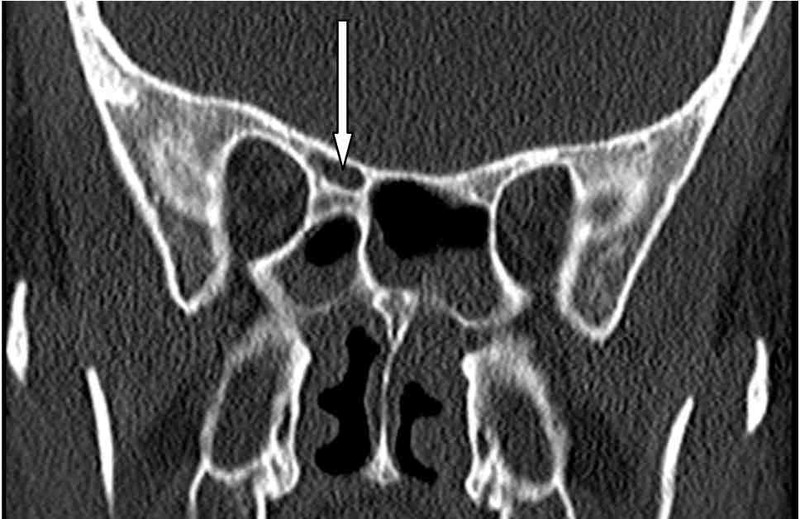 Asymmetry of the ethmoid roof: analysis using coronal computed tomography. Laryngoscope 2001 Dec;111(12):2122-2124. 6. Başak S, Akdilli A, Karaman CZ, Kunt T. Assessment of some important anatomical variations and dangerous areas of the paranasal sinuses by computed tomography in children. Int J Pediatr Otorhinolaryngol 2000 Sep;55(2):81-89. 7. Badia L, Lund VJ, Wei W, Ho WK. Ethnic variation in sinonasal anatomy on CT-scanning. Rhinology 2005 Sep;43(3):210-214. 8. Stankiewicz JA, Chow JM. The low skull base: an invitation to disaster. Am J Rhinol 2004 Jan-Feb;18(1):35-40. 9. Nouraei SA, Elisay AR, Dimarco A, Abdi R, Majidi H, Madani SA, et al. Variations in paranasal sinus anatomy: implications for the pathophysiology of chronic rhinosinusitis and safety of endoscopic sinus surgery. J Otolaryngol Head Neck Surg 2009 Feb;38(1):32-37. 10. Ali A, Kurien M, Shyamkumar NK, Selvaraj. 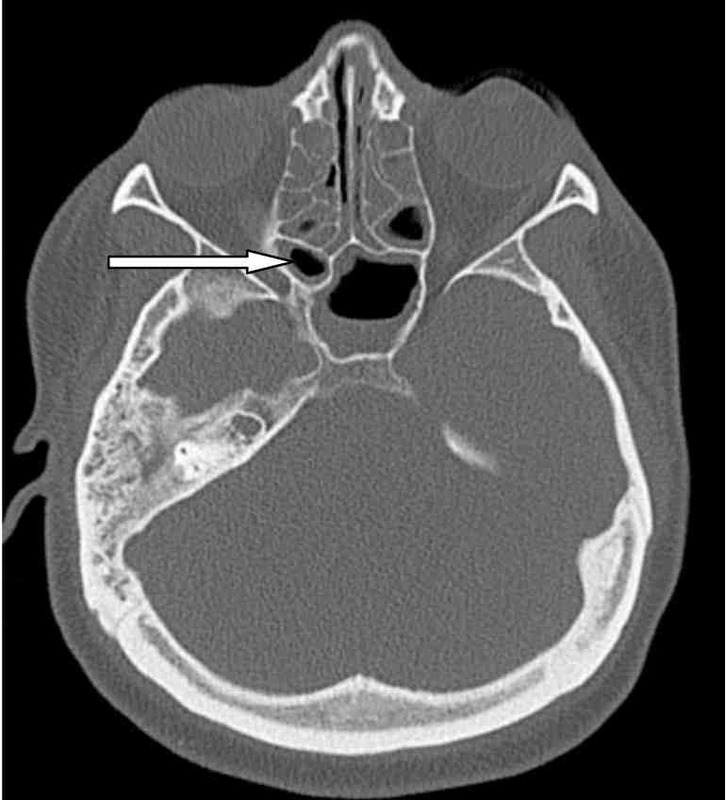 Anterior skull base: High risk areas in endoscopic sinus surgery in chronic rhinosinusitis: A computed tomographic analysis. Indian J Otolaryngol Head Neck Surg 2005 Jan;57(1):5-8. 11. Souza SA, Souza MM, Gregório LC, Ajzen S. Anterior ethmoidal artery evaluation on coronal CT scans. Braz J Otorhinolaryngol 2009 Jan-Feb;75(1):101-106. 12. Meyers RM, Valvassori G. Interpretation of anatomic variations of computed tomography scans of the sinuses: a surgeon’s perspective. Laryngoscope 1998 Mar;108(3):422-425. 13. Dessi P, Moulin G, Triglia JM, Zanaret M, Cannoni M. Difference in the height of the right and left ethmoidal roofs: a possible risk factor for ethmoidal surgery. Prospective study of 150 CT scans. J Laryngol Otol 1994 Mar;108(3):261-262.